Allies won’t help defend nations that refuse to defend themselves. The Naval Diplomat is not from Missouri, America’s Show-Me State. But I’m in a show-me state of mind following last week’s NATO summit in another Newport — Newport, Wales. Lofty words were said. The summit communiqué pledges, for instance, to restore some sanity to defense spending. NATO long ago fixed the standard for defense spending at 2 percent of GDP. Few meet the standard, but at Newport the NATO-European powers put everyone on notice that they’re really, truly serious about it. The small minority that already comply — Great Britain (for the moment) and Greece, alongside the United States — will “aim to continue to do so.” The majority that don’t vow to arrest further slippage. And they will “aim to increase defense expenditure in real terms as GDP grows,” and “aim to move towards the 2% guideline within a decade,” helping field viable forces. Aim being the keyword — or, more accurately, the key diplomatic weasel word — in these passages. How many European allies will fulfill their commitment, and how many will avail themselves of the escape clause? Barry Pavel of the Atlantic Council observes charitably that the uptick in budgets is “not going to happen across the entire alliance, but it’s useful for framing incentives for some nations to start to contribute more.” And that tepid prediction comes from someone who’s presumably a NATO enthusiast. So let me get this straight. NATO-Europe resolutely promises to try … to build up to a level that barely qualifies as peacetime defense spending … over the next decade … if GDPs expand to permit it. Wow. As a matter of alliance management, think about the message the Newport communiqué telegraphs. To us in North America, it indicates that Europe sees itself inhabiting entirely tranquil surroundings, untroubled by anything like, say, Russian aggression against an Eastern European neighbor. Well, if that’s the signal from European precincts, here’s how the U.S. leadership should reply: Fine. If Europe believes it has attained perpetual peace, the United States will accept its appraisal of the strategic setting. It will take the average of NATO-European defense spending and provide U.S. support on a matching basis. America, that is, will take Europe’s defense just as seriously as Europe takes it — and no more. Allied governments’ actions would set the standard for U.S. support. Here’s how it would work. If NATO-Europe dedicated, say, an average of 1.5 percent of GDP to defense, then Washington would recalculate its contribution to Europe’s defense as though the U.S. defense budget also stood at 1.5 percent of GDP. The Pentagon would then allocate a share of that 1.5 percent to Europe, factoring in other U.S. priorities such as the pivot to Asia, counterterrorism in the Indian Ocean region, and counterpiracy in the Gulf of Guinea. If that meant 0.5 percent of American defense spending went to NATO, so be it. Whatever that buys is what the alliance would get. The rest of the hypothetical 1.5 percent (along with the rest of the real-world U.S. defense budget) would fund forces to discharge commitments elsewhere in the world. The shade of Clausewitz, moreover, is demanding back his draft of On War from beyond the grave. 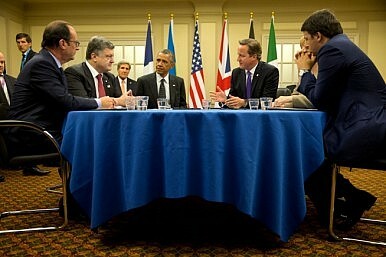 He wants to amend his discourse on alliance management to account for NATO-European leaders’ bizarre conduct. Clausewitz presents his views mainly in the context of cost/benefit logic. He saw a lot of rickety and broken alliances during years of campaigning against Napoleon — and poo-poo’s multinational ventures as a result. The task before statesmen and commanders, he says, is to gauge the value of the “political object,” or their nation’s overriding goals. That determines the “magnitude” and “duration” of the effort the nation invests in obtaining these goals. Make sense to you? Me neither. Will Europe provide for its own defense? Show me. And do it now — not a decade from now.